¼ cup poppy seed (optional) – can be soaked in ¼ cup hot water for 30 minutes and then blended in a blender. 1. 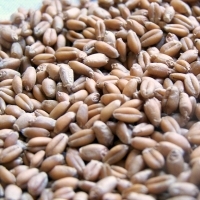 Rinse wheat berries and put in a pot. Cover with water (1 inch over berries) and soak overnight. 4. Add poppy seed and sweetening to wheat and simmer for approximately 20 more minutes. 5. Serve with silk cream or milk as desired.